The SpaceX Grasshopper test bed took its first hop yesterday in Texas, a “flight” of 3 seconds and about six feet in altitude. Doesn’t sound like much? It’s a Falcon 9 first stage with a Merlin 1D engine, generating 122,000 lbs. of thrust. I submit that it it more difficult to do a short hop like this than to launch the rocket normally. It’s been done before, of course, and for not a lot of money – the McDonnell-Douglas designed and built DC-X (for Delta Clipper Experimental) test vehicle proved in the mid-1990s that a rocket could be launched, hover, move horizontally, and land again safely. Development funding of the DC-X was scammed from the Strategic Defense Initiative – “Star Wars” to you lib types – and after the money ran out and the vehicle suffered some damage to the aeroshell, it was transferred to NASA. Of course, not leaving well-enough alone, NASA had the vehicle rebuilt with a lithium-aluminum fuel tank (a brand new technology at the time) and it was flown several more times. It finally was “retired” after a landing strut failed to deploy and the craft tipped over on landing and was heavily damaged. DC-X proved a number of things: automation, navigation, orientation, throttling of the engine, all were very doable. The design could have been scaled up to a full-sized vehicle. However, it never had a lot of support in NASA (they were fooling around with LockMart’s X-33 boondoggle at the time) and the crew was very demoralized by the government’s on-again off-again support. 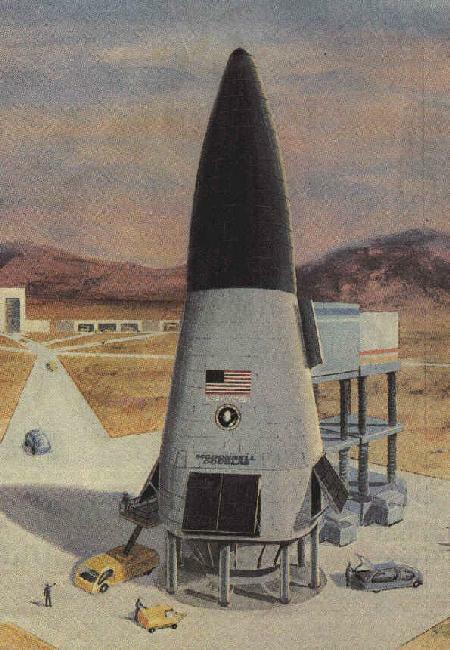 Jerry Pournelle, one of the main promoters of the DC-X program, has since had concerns about whether a single-stage-to-orbit vehicle is really possible with the current state of technology. The weight of the airframe, passengers and cargo could just be more than a single-stage vehicle could lift all the way to orbit. Right now we throw away dead airframe weight as needed by using multistage rockets and strap-on boosters. 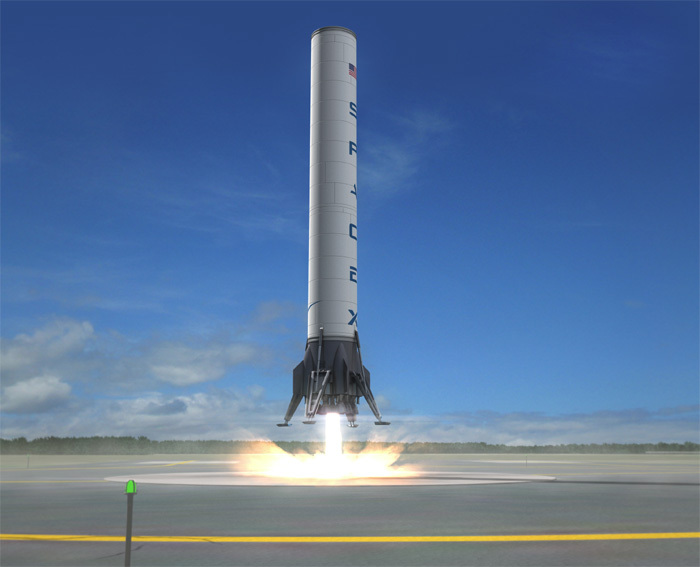 Grasshopper isn’t designed to be that; it is designed off the first stage of the Falcon 9 and is intended as a technology that will enable SpaceX to return spent stages to earth for refurbishment and reuse. (The Dragon capsule already has maneuvering rockets designed for the escape system that could also make soft landings on a hard surface possible.) Eventually, SpaceX wants to reuse both stages of the Falcon (landing the second stage will be the real trick) by vertical powered landing. One of the problems with DC-X was that it was powered by an engine using LOX and liquid hydrogen. While that combination is the most energetic available, the liquid hydrogen is not nearly as dense as any other liquid fuel, requiring a larger tank and one constructed of a material that can handle the extreme cold. The Falcon, using tried-and-true LOX/kerosene and today’s materials and manufacturing, apparently will have the propellant fraction necessary to have enough remaining fuel to make a soft landing. Obviously in the 20 years since the DC-X was designed we have seen huge advances in automation, computer science and miniaturization. Witness the Dragon linkup with the ISS a few months ago to see how a start-up company could create a new vehicle of a class only a nation’s government could create in the past. I know they received a lot of government funding. After all, NASA is going to be one of their primary customers. However, the entire business model is different from the way LockMart or Boeing goes about building spacecraft and rockets for the government…at least, the way they used to. They are now the competition for Elon Musk’s company, of course. 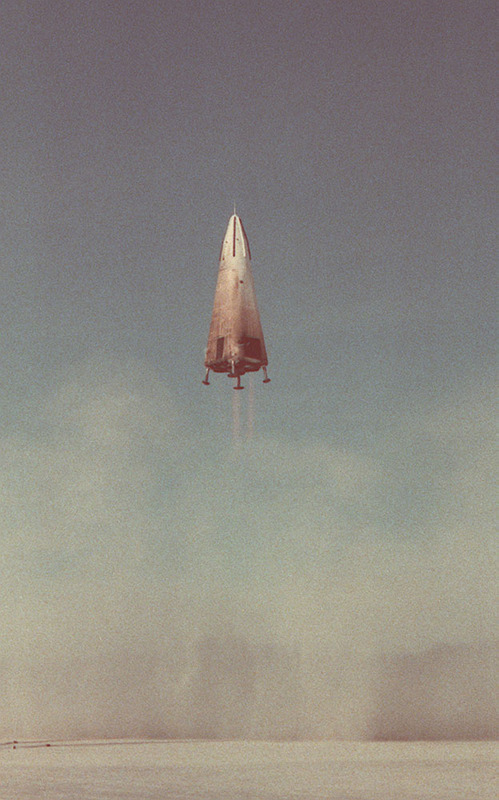 I think in many ways we will eventually see this little hop by the Grasshopper to be as significant an event as the first test of the Shuttle’s unpowered gliding descent systems in the development of space technology. The next test is to hover the vehicle at 100 feet before a soft landing. You are currently browsing the The Old Gray Cat blog archives for the day Tuesday, September 25th, 2012.